Today recipe with Phyllo sheets is quite easy and quick. It is soooo light and you will end up your dinner just with three ingredients. 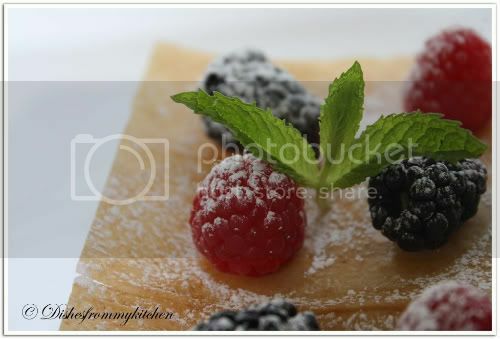 Here is Yummy dessert with fresh berries !!!! 1. Preheat the oven for 375 degree f .
3. Slightly brush with melted butter. 4. Put it in the oven and bake for just 8 to 10 minutes or until light brown in color. 5. Now in the serving plate. First put 2 layers of sheet spread the cream and add the berries. 6. On the top keep two more layers, spread the whipped cream and berries. Similarly layer one more time. 7. Dust with icing sugar and garnish with fresh mint leaf. You can be more creative by drizzling melted chocolate and adding nuts along with whipped cream and berries. Mix the Mascarpone cheese, whipped cream and chopped strawberries tastes yummy with phyllo layers or cups. Wowwwww.. .looks sooo tempting dear.. loved allthe pics and presentation.. nice job!! wow awesome.. mouthwatering dessert... Nice click.. Simply tempting! 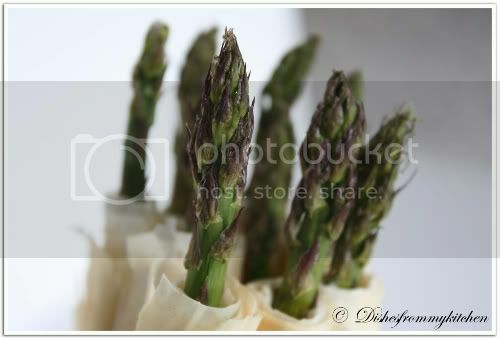 Filo pastry rolls the asparagus tip up...a beautiful creation. Wat an elegant and beautiful dish, fabulous work Pavi.. Interesting way to eat berries.Super idea. Very Beautiful! A elegant and simple dessert. The recipe looks very simple and the photos are awesome. What beautiful pictures you have clicked. Would have loved to take a stack from the plate. Delicious looking dessert! Fabulous pics too..
Wow..delicious and tempting...nice clicks Pavithra. Wow looks so yummy ..nice pics and presentation dear. berries and cream cannot go wrong..and that pic speaks for itself. slurpy! Awesome works of arts & taste..... Yummy & Splendid!!! 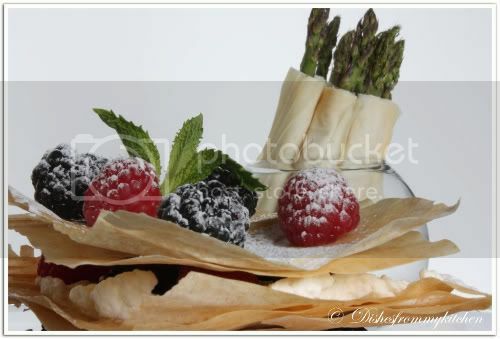 I love any dish made with phyllo sheets.Yours is looking mighty good! I am not very good at handling them as they are very delicate. So i binge on it whenever i am my buddy's place.One of my turkish friend has promised to teach me to make baklava with it this week. Lovely dessert by the way. Hey, about the Lentil loaf, give it a try cause its been on my list too. Phyllo layers look delicious and beautifully captured on camera.The only problem with this dessert is that its damn hard to eat it daintily as it crumbles every where and the cream oozes everywhere.lolz...........But who cares as long as it tastes wonderful and I am sure yours look devine and taste delicious too. I didn't know such sheets exist. Looks very lovely and colourful !!! I am a big fan of phyllo pastry. Love to mak desserts using that. Yours looks so beautiful. Awesome presentation!! Love the recipe..
Pavithra - these look gorgeous! Love the pictures - they look like model pics! I made the asparagus covered with phyllo last month for a party and the recipe is still in my drafts! Will hopefully get to it soon. Love the simple recipe - perfect for the nice berries available now! awesome idea Pavithra! looks simply superb and yummy. That looks so beautiful..your dishes and pictures are always so nice..
Nice dish.. easy to make and tasty! Wow,its very new to me! You rock with international recipes! All the pictures are too good! what gorgeous berry napoleons! i love phyllo in anything! 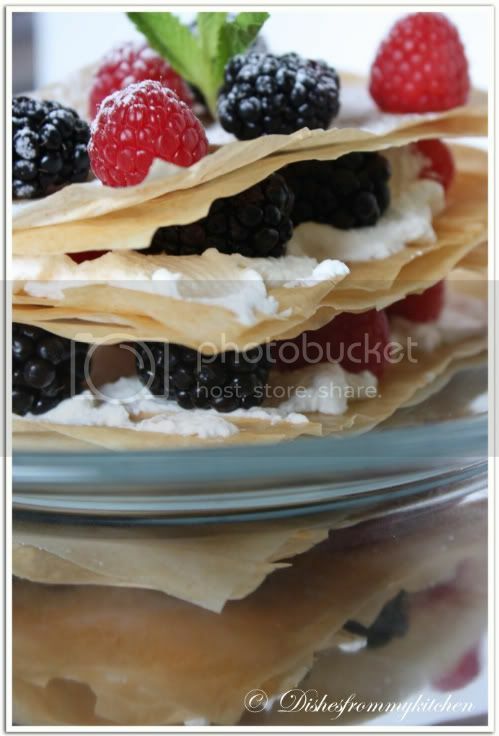 oh wow, i love any desserts made from phyllo and this one looks delicious and so tempting! this is making me so hungry, dear!!..yummy...drooling! woww delicious n beautiful pics!! Whooo, looks delicious and very tempting. Awesome clicks...beautiful presentation...love it. 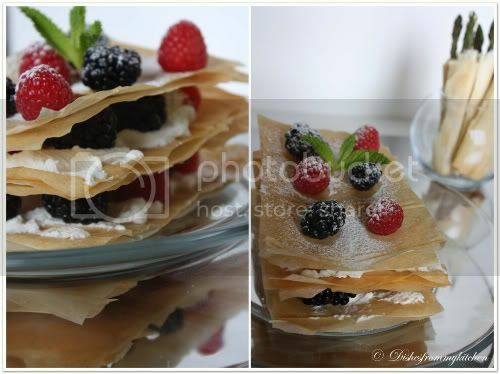 INcredible phyllo layers topped with berries.It's a treat to the taste bud.Fantabulous clicks pavi. Awesome Pavithra....love the berries wit cream. Wow, these look fab, beautiful. What a creativity, following you. Thanks for visiting my blog. Wow! 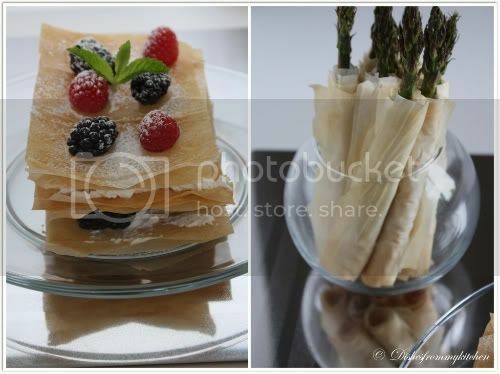 Pavithra the phyllo with cream looks yumm yumm.Beautiful pictures. Very cute presentation dear. Phyllo dessert looks gorgeous like a professional made. 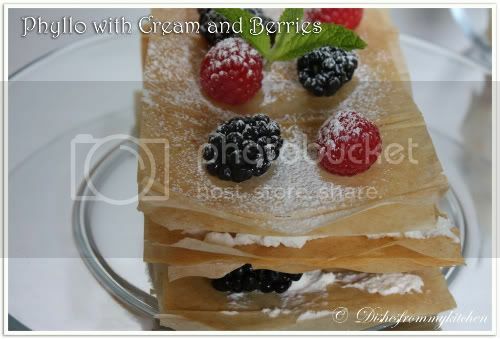 What a great use of phyllo - the cream and berries looks beautiful. I also like the wrapped asparagus. Delicious recipe.. I always loved the way you take the pictures. Wow, what a creativity and such beautiful arrangements and pics. Simply superb !!! Simple and delicious Pavithra, love cream and berries combo! 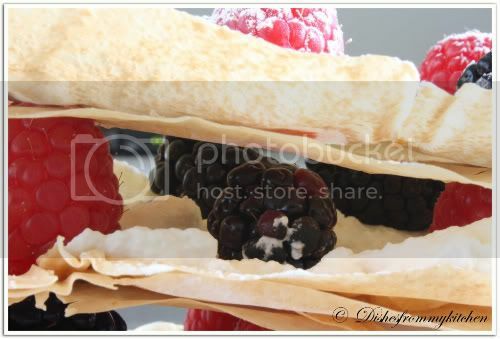 looks delicious :) i wonder if the berries were cooked with the phyllo, would it be as much fun or a gooey mess?? Awesome!.... looks tempting and delicious. Lovely click.